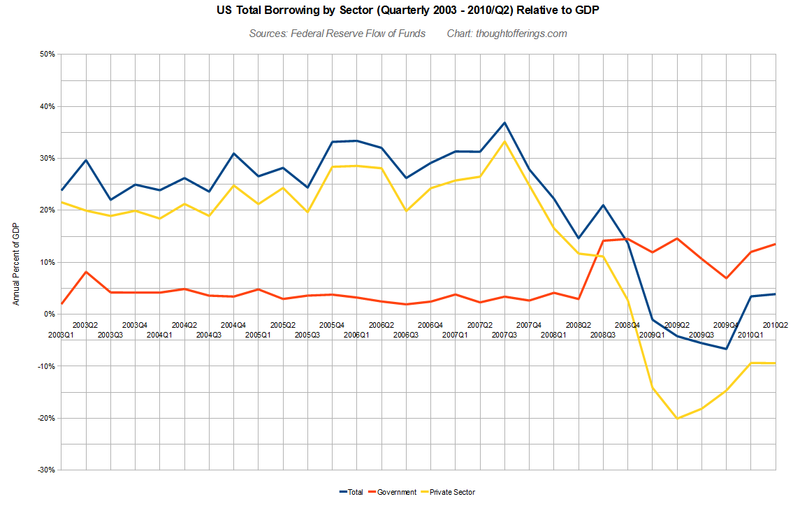 Total borrowing (blue line) has been positive again for the last two quarters, with government borrowing (red line) increasing and private sector borrowing (yellow line) contracting less slowly. Government and the financial sector between them dominate all other sectors with respect to their effect on the overall trend. Why do these graphs matter? For several reasons discussed in past posts... 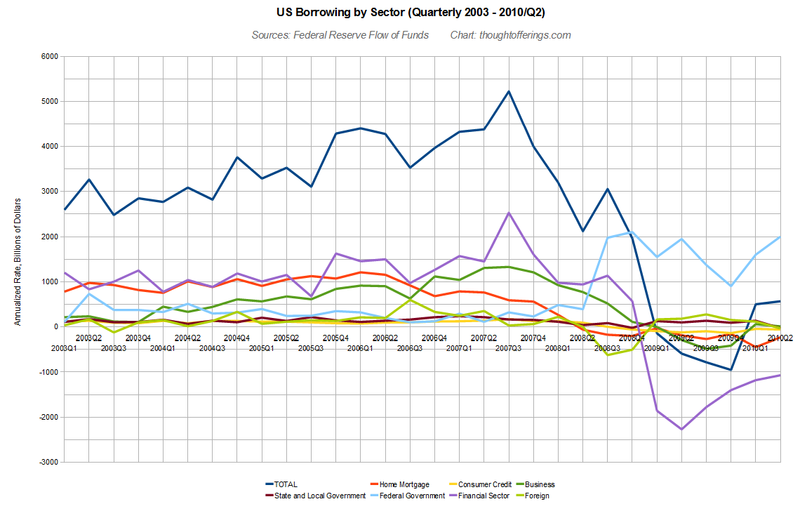 This is one way of showing that clearly the government is NOT crowding out the private sector in the debt markets, given how high total borrowing has been in the past. Fortunately this point has become obvious to most observers over the last year. Another is that it shows in rough terms the magnitude of the government support for the economy (much of it driven by automatic stabilizers) in the context of the peaking and collapse of a private sector credit bubble. 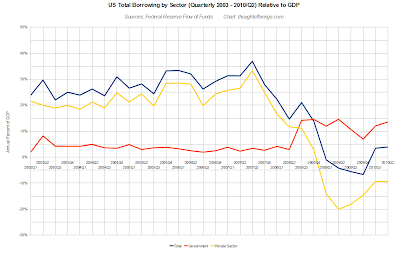 (There are better ways to look at the government's role, as I admit the borrowing data is only a crude proxy). With respect to the post title, it's not a given that debt deflation won't yet emerge (for example, if GDP double dips and private creditors are allowed to suffer more losses than they did in 2008, but we are missing smart policy to limit contagion). 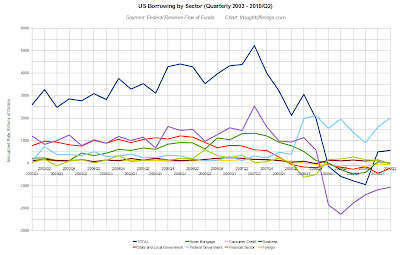 But Great Depression severity debt deflation has clearly been averted so far for a variety of reasons, a major one of which is stronger automatic stabilizers. On the last update, I noted some ongoing questions, such as the extent to which the negative private sector rate of borrowing reflects a voluntary paying down of debt versus involuntary factors like defaults. In the past there has been evidence of each. However, several bloggers have recently cited this WSJ Real Time Economics post. It notes that in the last two years, mortgage debt and consumer credit have contracted at a 2.3% annualized rate. But after removing the effect of defaults, the contraction rate is only 0.08%! While that suggests defaults are the dominant factor, they note at least a little room for frugality taking place as well: "Defaults happen even in normal times, and are typically offset by even stronger growth in new mortgage and consumer loans. By holding their debts steady, consumers are actually being a lot less profligate than usual."